Here is what I've got going on this year. First up, Lori Holt's "Have Yourself a Quilty Little Christmas". Have you seen this? She had the cutest little quilt along during the holidays. I just couldn't squeeze it in with all of the gifts I was trying to finish up, but couldn't wait to get started. I have decided to change it up a little bit and make the quilt bigger by making some of the blocks into rows like her row along from a few years ago. My goal is to finish a block or row every month and have a finished to by Christmas. So far I have trees and gifts. Aren't they so cute? 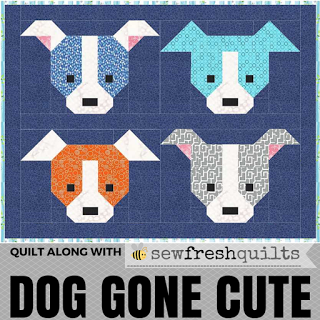 Next up, the Snapshots quilt along, hosted by The Fat Quarter Shop. This looks so cute! I decided to use up some 30's fabric that has been gathering dust in my stash for an embarrassingly long time. My first block is done. Such a cute cake. I am really excited about this one because I just love the fabrics that I have pulled! I already can't wait until February's block comes out. Next is a quilt along that I am doing on my own. This is a kit that our LQS hosted about 2 years ago. Somehow I missed it. I've got the whole kit, and my goal is to finish a block a month. So far, I've got 2 months done. Woo hoo! Finally, I am going to join in on the Twisted Irish Chain Quilt Along. Wow, you're going to have so many cute quilts by the end of the year! Way to go! I like having so many projects going at once so I can work on whatever best suites my mood. You've got some lovely projects to keep you happily busy!